The word Mikeitz means “At the end,” as in the saying, “the end of days” (Daniel 12:13). In Jewish mysticism, “left” represents the side of evil. So, the “end of the spiritual left” refers to the day when evil will cease to exist, with the end of exile, i.e. “the end of days” (קץ הימים). beginning. 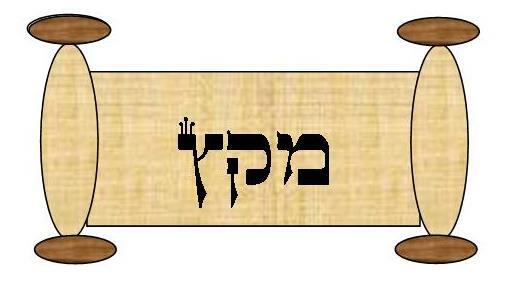 The term (“קץ הימין. end of the spiritual right”) is thus an allusion to the’ final redemption, when good will triumph over evil, and we will see how good is found consistently through­out the entire world. We are thus left with the question: Which “end” does the word Mikeitz refer to-the “end of the left” or the “end of the right”? How could the two opposite concepts of exile and redemption be alluded to by the same expression? Chasidic thought explains that the inner purpose of exile is that the Jews should be scattered around the world in order to “rescue” sparks of holiness which had been lost in physicality. Thus, redemption is not the elimination of exile, but rather, it is the goal of exile. And therefore, both concepts are hinted to by the same word. The story of Chanukah and the story of Joseph in Miketz relate to each other in the common themes. The story of Chanukah begins with terrible conflicts between Jews and the Greeks in the takeover of the Temple. There are also internal conflicts among the Jews. Not all Jews were in agreement. There were many who embraced Hellenistic culture, and those, like the Maccabees, who rose up against Hellenism in order to preserve Judaism their way. The fight over the Temple is long, and much is lost. Although this point in our history is full of political conflicts, on Chanukah we have come to commemorate this story by focusing on the miracle of the oil burning in the Temple after it was reclaimed. Like Joseph, the heroes of the story of Chanukah had to take what they were given and use it to their best advantage. The Maccabees were rewarded with the miracle of the oil burning for eight days. Our eight-day celebrations commemorate the miracle that God gave them in their victory, but it also reminds us of the chaos and hardship that preceded the miracle. Both Joseph in Miketz and the Chanukah story teach us about gifts that we possess, as well as how we use what is given to us to interpret and influence our situations. It is difficult to see through chaos and know that we are preparing correctly for the future. Joseph’s gift of interpreting dreams made him a rich and powerful man, but it also alienated him from his family. Had the Maccabees not held out in their long and vastly outnumbered fight, they would not have reclaimed the Temple. There were also many costs to their battle, including a large divide within their community. Through these stories, we see that there is strength in looking through the chaos of the present and focusing on the future. In the little time we have to relax during the eight days of Chanukah, we have the opportunity to think about the decisions we make to influence our future and celebrate our successes, as individuals and as a part of a community.